Baked sweet potato recipes...For baking enthusiasts and for a scrumptious way to get delicious sweet potatoes into your family's diet. Try these varieties of baked recipes. The healthiest and easiest way to get the scrumptious taste of sweet potato. Goes with everything! Step outside the norm... A great healthy side dish alternative to the white potato. Want a sweet treat? Your family will praise you for trying one of these pie recipes. Bread lovers rejoice! Sweet potatoes in quick breads, biscuits, rolls, crescents... There's no limit to how you can get these nutritious potatoes into your diet. Delicious, nutritious, baked goodness in a casserole dish. These casserole recipes are sure to spice up the family dinners. Preheat the oven to 350° F. Combine the flour and brown sugar. Cut in the butter using a pastry blender or food processor. Stir in the oats. Press into an ungreased 13x9-inch baking pan. Bake for 15 minutes. Maintain the oven temperature. Combine all the ingredients. Pour over the crust. Bake for 20 minutes. Maintain the oven temperature. Combine all the ingredients. Sprinkle over the filling. Bake for 15 to 20 minutes, or until set. Cool, then cut into squares. Peel and cube 3 sweet potatoes. Toss with 1 slice red onion, 2 tablespoons of canola oil, 1 teaspoon, each, of cinnamon and cumin, and 1/2 teaspoon of salt. Transfer to a baking sheet and roast in a 400 degree fahrenheit oven for 25 to 30 minutes, until fork tender. 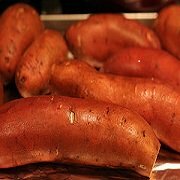 Scrub 6 to 8 medium sweet potatoes or yams and, if desired, rub with small amount shortening for softer skins. Prick with fork to allow steam to escape. Cook in 350° oven until soft, about 50 minutes. To serve, cut crisscross gashes in each potato; squeeze gently until some potato pops up through opening. Dot with margarine and sprinkle with salt and pepper. Microwave 2 sweet potatoes for 6 minutes. Then mix together 2 tablespoons, each, coconut flakes and chopped pecans, and 1 tablespoon each with melted butter and brown sugar. Make a slit in the potatoe and top with filling and bake in a 400 degrees fahrenheit oven for 12 minutes. Preheat oven to 400 degrees fahrenheit. 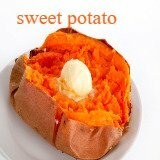 Wrap each sweet potato in foil, place on oven rack, and bake for one hour, or until tender when pierced with a fork. Remove from oven and allow to cool 15 minutes. Cut each potato in half lengthwise and carefully scoop flesh into a bowl, leaving shells intact with 1/8 - 1/7 inch of flesh. Place shells in a baking dish and set aside. Using and electric mixer, mash flesh until smooth. Mix in margarine, brown sugar substitute, and spices. Drain pineapples well, forcing out extra liquid with the back of a spoon. Stir drained pineapples into mashed sweet potatoes, spoon filling into shells, sprinkle with walnuts and press in marshmallows. Then put back into oven for 8-10 minutes, or until marshmallows are slightly toasted and potato is heated through. Do you have baked sweet potato recipes to share? You can submit your own favorite recipes here!